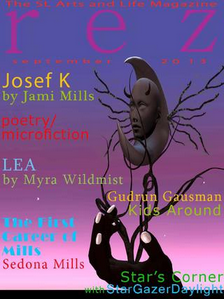 Jami Mills takes us on a whirlwind tour of one of the most important collections of virtual art in SL, in her article Josef K, in which she serendipitously interviews the maestro himself, Josef K. Xander Stillwater is the subject of Cat Boccaccio, who poses her 14 Questions. Myra Wildmist enlightens us about the artistic opportunities that Linden Endowment of the Arts (LEA) provides us in her piece The Arts in Second Life. Long time contributor, Gudrun Gausman, brings us I've Been a Goat Since I Was a Kid, in which she teaches us about horns as only she can do. StarGazer Daylight contributes her Random Fashion Thoughts, and in so doing, kicks off her introductory piece on SL's fashion world. Sedona Mills muses about the oldest profession in SL, in her article The First Career of Mills. Crap Mariner makes our mouth water with chickens, biscuits, cole slaw and princesses in his microfiction offering, Princess. Finally, poet Adrian Brody warns us about payback in his wonderful poem, Knife a poet, become a stanza.